I’ve always loved stories by Roald Dahl, I wish I could have jumped into his brain and listened to the whirring of the inventive musings. We are all so lucky that he put down on paper his thoughts and generously shared them with the world. I simply can’t wait to share one of my favorites stories with Emily my six year old daughter. My lovely little lady can watch Charlie and The Chocolate Factory (Gene Wilder or Johnny Depp) and Matilda on loop but this is her first experience of the grasshopper, centipede, earthworm, spider, ladybug, silkworm and glow-worm of James and the Giant Peach. What’s even better is that it’s on stage rather then screen at one of Emily and my favorite places, Northern Stage. Dahl’s first novel for children tells the story of a lonely little boy named James. He escapes in a giant peach after a magical encounter and finds he’s capable of much more than he ever imagined. 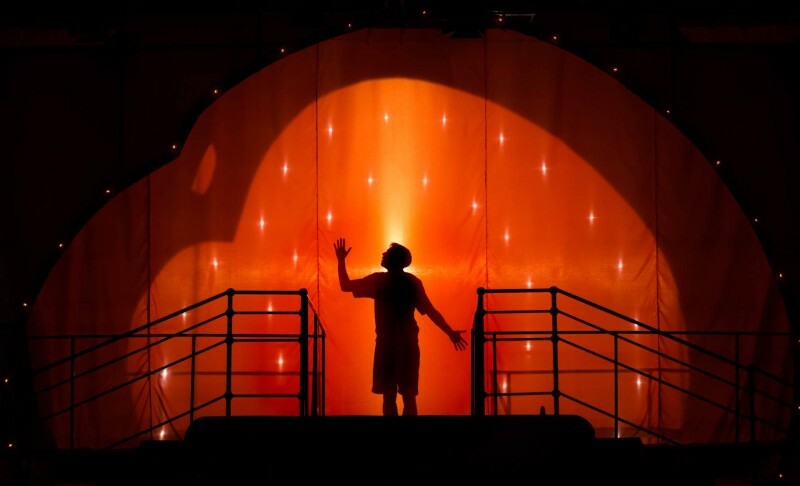 James and the Giant Peach is a massive show which deserves to be on a massive stage, so for the first time in Northern Stage’s history we’re using both of our stages combined into one huge space to tell one story. It’s so exciting to be working on this scale, taking the audience on an epic adventure that deals with being lonely and discovering how important friends and family are, which is not a bad tale to tell at Christmas time. Adapted for the stage by David Wood OBE and directed by Mark Calvert (who first introduced me to Northern Stage with 40 Babies back in 2009/2010), this new Northern Stage production has been designed by the ever-inventive Rhys Jarman (Institute, Gecko£), with original music inspired by big bands and swinging Broadway musicals of the 1940s and 50s. Recommended ages 5-11 years with a running time of two hours (including interval). The production runs until Sat 31 Dec so why not book your ticket here . We’ll be posting our review soon but keep an eye on twitter and instagram for photos of our evening. Next Post This is your Captain Speaking!